The Fryeburg New Church has set up this fund to help pay for work, done in the summer of 2017, to our Bell Tower Steeple and Spire. The building was erected in 1878-79 by master carpenter Calvin Merrill after designs by Portland architect Charles H Kimball. 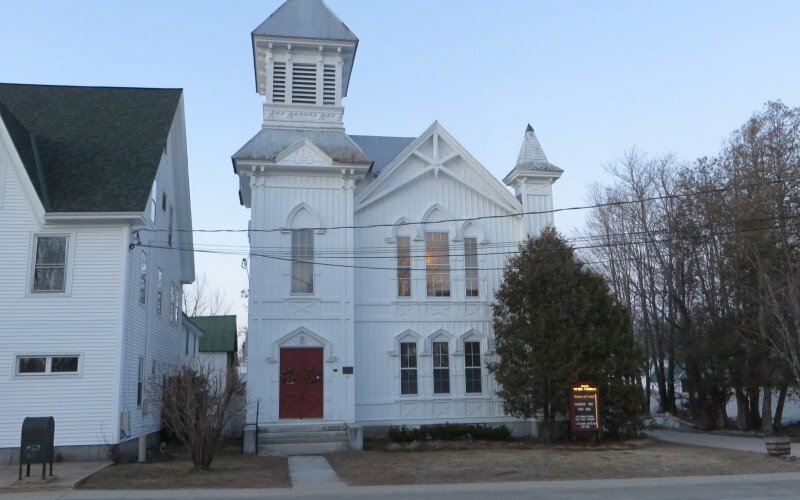 The church was dedicated in August 1879 and placed on the National Register of Historic Places in 1986. Our church contracted with a local Maine contractor to repair and paint the steeple and spire. The old steel roofing was replaced by new asphalt shingles on the tower roof and 25% of the church roof at the base of the tower. A gear on the bell's mechanism needed to be replaced, as well. This work came in at a quoted price of $22,520.00. The discovery of rot and extensive damage found in and around the spire added on extra $9,300.00 for a total due of $31,820.00. We raised $12,520.00 through fundraising efforts, Capital Campaign,funds and generous donations/grants. A loan of $10,000.00 from our General Convention made it possible to pay the original quoted price in October. This fund is to help our church repay the $10,000.00 loan and pay the extra $9,300.00 due. A donation of any dollar amount will be greatly appreciated and all funds donated come to the Fryeburg New Church. For more information about our church check out our website at Fryeburgnewchurch.org.